MSC Orchestra features a greatly improved range of dining options than its older fleet-mates though a majority of passengers still choose to dine in the main dining rooms, in which evening meals are set-seating, set-tablemates affairs. The simple reason is that all other evening options carry an extra charge. Villa Borghese and L'Ibiscus, nearly identical in size, serve as the main dining rooms. Breakfast (from 7 until 10 a.m.) and lunch (noon until 1:30 p.m. or even 2 p.m., depending on the day) are open seating. Dinner, as mentioned, is not. Seatings take place at 6:15 p.m. and 8:30 p.m. So far, I have traveled twice on MSC ships, and I've had bad luck with table assignments both times. In fact on this trip, a Swedish couple who was at my table for four opted for a two-top, and so, traveling solo, I occupied the table alone. Changes happen, of course, in the fixed seating scenario, but what was disappointing was that the headwaiter neither noticed nor attempted to correct the situation. He never once even stopped by to say "good evening." 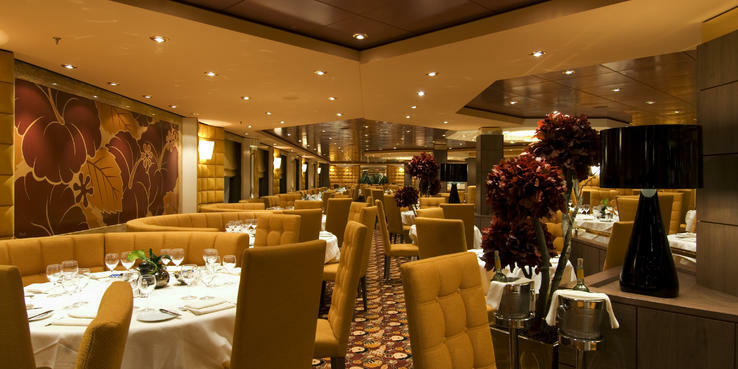 The ship's buffet venue is Cafeteria La Piazzetta. Breakfast is available from 6 until 10 a.m. It offers the usual suspects, from cereals to cold cuts and fruits to pastries, along with a made-to-order omelette station. Overall, the breakfast offerings satisfy American, European and British tastes. At lunch, the restaurant's open from noon until 4 p.m. (rather late for a buffet and much appreciated). The food offerings range from chicken, meat and fish entrees to a carvery station and from sandwiches to pasta and pizza. The extension of the lunch hours was a definite plus both in allowing for more flexibility and also in helping to disperse crowds (this eatery was easily overwhelmed at peak times, and there were more passengers looking for tables than were tables available). Fortunately there are a fair number of tables in covered areas outdoors. I found that it was better to try this casual dining option early -- or late. The layout is one culprit -- the buffet was designed with old-style counters (rather than action stations), therefore you have to queue at the beginning of the line and pass through all the options, from starters and salads to desserts, before you're done. It's worthwhile to note that both breakfast and lunch fares offer excellent variety; check both sides of the buffet lines as sometimes items are different. If experiences at the ship's standard dining rooms and buffet venue were less than outstanding, the ship's alternative options for evening dining, though levying extra charges, were quite an improvement. I loved the open-seating pizzeria and kebab service, offered in part of the Cafeteria La Piazzetta (which during the day is part of the buffet operation). Pizza and kebab are served nightly between 7 and 10 p.m., but prepare to pay from 5.20 to 9 euros for your pizza, calzone or kebab. Pizza was excellent; a favorite was the Orchestra, with tomato, mozzarella, Parma ham, rucola and parmesan cheese. The Shanghai Chinese Restaurant is the best eatery onboard. An intimate space with no windows, it's open for lunch (noon until 5 p.m.) and dinner (7 p.m. until midnight). Its rather large menu consists of cuisine from various regions of China, including Cantonese and Sichuan (even the bar menu features Asian beers). The cost for my miso soup, Peking duck and half a liter bottle of beer was a reasonable 17.40 euros. At times, service could be slow -- waiters apologized that service was hampered by a small galley -- but very attentive and knowledgeable. Another excellent option was La Cantinella Wine Bar, which, oddly, acted as a sports bar as well. The wine bar -- well stocked with some 60 different wines from all parts of Italy -- has a separate food prep area, and chefs prepared small bites to order, like foie gras and antipasto (a couple of times, a plate of cheese and cold cuts substituted perfectly for a heavier meal in the dining room). Editor's note: The ship's wine sommelier (with experience from Disney and Regent Seven Seas Cruises) was very knowledgeable about Italian wines and quite enthusiastic about sharing his passion; he gave several lectures but was also frequently available for any questions or suggestions. Room service features a simple menu; you'll mainly find cold sandwiches. As is customary on MSC, there's a charge of 5 euros. Supplementing the standard menu is a "special feeling" list of choices; you can opt for Foie Gras & Brioche (16 euros) and chocolate strawberries (11.50 euros) among them. There are several coffee bars onboard, and except in the buffet restaurant during meal time, expect to pay for your cup of coffee. If the sweet offerings of Amber Chocolate Bar (sells pieces of chocolate, prices starting below 1 euro) are not enough, there's El Sombrero Bar and Ice Cream Shop on the sun deck. Ice cream comes in cones and cups, and flavors change daily. Charge is 1 euro.